What Should You Do After You Have Been in an Auto Accident in Lewisville? Stop. Stay at the scene of the collision. In Texas, the penalties for hit and run are severe. Provide reasonable assistance to any injured persons. Do not move anyone who is badly injured, unless there is danger for greater injury by leaving the person alone. Call for an ambulance when injuries are severe. Do not volunteer any information or make comments about the crash to anyone, including insurance companies, other drivers, or other parties involved. Do not sign any pieces of paper and do not agree to pay for damages. Identify all drivers, passengers, pedestrians, and witnesses and ask them to remain at the scene of the accident. Write down their names, addresses, phone numbers, license plate numbers, and an account of what they saw. Do not rely on the police to obtain this information. Oftentimes the names of witnesses and even passengers are not included on the accident report. All drivers must identify themselves to each other. Copy down information contained on all driver's licenses, vehicle registrations, and insurance cards. Call the police or Texas Highway Patrol to ask them come to the scene to take a report. If the police are not called or will not come to the scene of the accident to file a report, you have 10 days to go to the police station to file a written report. While you must cooperate with the police officers investigating the case and you must sign traffic tickets, you should only provide the basic facts. Do not provide personal comments or interpretations of the accident. Stay calm. Tell the truth. Take down the name and the badge number of the police officer involved. Ask when and where you can pick up a copy of the accident report. Make a diagram of the accident, showing the positions of the cars before, during, and after the impact. If possible, note the positions of traffic lights and street signs, estimate the respective driving speeds, and record details about the weather and road conditions. Take pictures. If a camera is not available, use the camera feature on your cell phone, or ask a reliable witness if you can use theirs. Remember, a picture is worth a thousand words. If your cell phone has a video option, take video of the vehicles, scene, and even the other drivers. Seek medical attention as soon as possible. Even if you think that the pain will eventually go away, it is best to be checked out by a doctor. Either an emergency room doctor or your general practitioner can see you for complaints of pain. Normally these doctors will refer you to a specialist if one is needed. Contact your insurance company, usually within 24 hours, to file a claim. Provide only the facts of the car accident. Avoid comments or interpretations of what happened. Do not give a recorded statement to any insurance adjuster until after you have consulted with a Lewisville car wreck attorney. Get in touch with a skilled lawyer immediately. 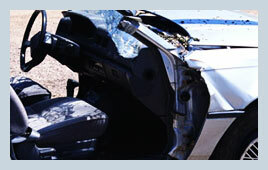 Contact Steele Law, P.C., at (214) 333-9393 for immediate assistance on what to do after a car crash. An experienced attorney can clarify your rights and discuss your options. Lewisville Vehicle Accident Attorney Disclaimer: The information presented on this site should not be construed to be formal legal advice nor the formation of a lawyer or attorney client relationship. Any results portrayed here were dependent on the facts of a particular legal matter and results vary from case to case. Please contact a lawyer at Steele Law, P.C. for a consultation on your particular case. Steele Law, P.C., represents people throughout Texas.